The World Cup result-predicting feats of Paul the Octopus have been marked by a memorial at the German aquarium where he enthralled sports fans last summer. 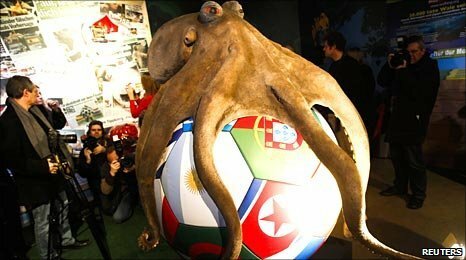 A giant plastic replica of the celebrated cephalopod clutching a World Cup football was unveiled at Sea Life in Oberhausen on Thursday. Paul, who died last November, correctly tipped the outcome of all of Germany's games in South Africa. He was also right in opting for Spain to beat Netherlands in the final. Paul, originally from an aquarium in Weymouth, Dorset, whose exploits made headlines around the world, made his selections by choosing to open one of two containers placed in his tank, each containing a mussel and bearing a team flag. Sea Life spokeswoman Tanja Munzig said Paul's cremated ashes were placed in a gold-leaf-covered urn inside the ball. What are the chances Paul the octopus is right?